Holiday: A Soldier Is Never Off Duty; the latest film by talented writer/director A. R. Murugadosss is his second Hindi film. His first film Ghajini is the remake of his own Telugu film of the same name. Which itself was inspired from Hollywood blockbuster Memento. 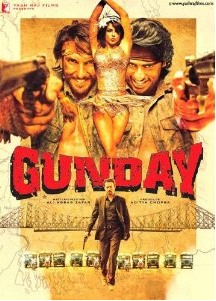 Holiday is also a remake of his own Tamil film Thuppakki (means: Revolver). The original was a commercial and critical hit. It seems that A. R. Murugadoss have got the art to keep the pulse of the viewer and determine his/her likes/dislikes. The film is a complete masala film with larger than the life action scenes and comparatively good music. If you compare it with the music of Ghajini, it is not up to that mark, but it is popular. He is really in full form as the writer and director both. The only let down part is Govinda’s track. Govinda acts effortlessly and he is adorable; but either the track should have been given more footage or completely avoided. It fails to generate the humor, it is expected from it, otherwise. Actually the movie should have contained a surprise package in him, by having a key role to play in the climax. It would have made nice positive effect on the movie as a whole. The film revolves around Akshay Kumar and he acts naturally. He already have the features needed by the character he is playing and he is convincing. There are a few action and emotional scenes where he delivers his genuine performance. But the major part of his role is action and thrilling sequences. Sonakshi is in Boxer avatar only for a single scene. Also the way she behaves with her parents after the meeting with the possible – groom to be – is not looking very effective. She acts well though, when trying to get Akshay fall for her. Sumeet Raghavan does his bits and he is convincing. But we don’t see him in action. It could have been interesting to see him performing an action sequence. Also Sonakshi plays a boxer, why can’t she have an action sequence or something similar in climax. First showing her as a tom boy kind of a girl and then keep her to – sing songs – and – make hero moving around her – acts, doesn’t look effective. Though, we are sure that the majority of the audience may not mind it! Freddy is another surprise package in the villainous role. He looks a very genuine guy next door who is educated and adorable (and unsuspected). He is having a good looks and acts also convincingly. It seems a bright future for him. The background music is fantastic. The songs are above average. The cinematography is really good. The writing is gripping. Though there are some scenes which might have better written. For example the army officers (who work in DIA especially) could have known that if a bunch of guys follow someone in 3 piece blacks suits on the roads and streets of Mumbai, the suspect could easily know that he is being followed. But if you let some points go, it is definitely an action thriller which is entertaining. Some dialogs are really punchy. After a long time there came a Hindi film which talks about nation and pride of the same. Also the way a serial blast was stopped being happened, and the bomb planters are executed at the same time, is filmed effectively and public will surely like it. Virat works as a Captain in D.I.A. (a wing of Indian Army) return to his home to spend holidays. His parents are keen to find a good bride for him during the period. He has a good friend named Mukund who is a PSI in Mumbain police. Virat’s parents took him directly to Saiba’s home, who is a potential candidate to be bride of Virat, according to them. Virat however finds her simple girl next door and rejects her. But one day he saw her in a boxing ring and then decide to marry her as her personality is what he wish her bride should have. One day when he was traveling with his friend in a public transport bus with his fiend Mukund, they found a pick-pocket is done in the same bus. When trying to get the pick-pocket Virat found one suspect. But the suspect wasn’t the one who stole the purse of a passenger! Why he was running then? The answer was shocking! Before he can speak anything, Virat see explosion of the bus and a number of innocents die on the spot!!! So he was the man who was carrying the bomb to some place and then at a certain moments the bombs could have been triggered and the entire city would have been shaken! Virat found a way to get the information and stop this from being happened, but will he be able to do it? Will it end the story or it just moves it ahead? Who is on his side and who are his opponents? All these questions are answered in rest of the film. As stated earlier, the movie has its own flows, but action thriller lovers will enjoy it for sure.